My kids are too stinking cute. I love their creativity and eagerness to dig into any project and give it their own unique touches. Several times a week Roo will ask to make a craft, similarly several times a week Harper will raid our craft closet and take off with anything she can reach... We now know they like to craft; if you add a good story into the mix it quickly turns from like to love. A few weeks ago we checked out The Giant Jam Sandwich by John Vernon Lord. I thought this would be a fun book to check out, it also seemed like a good way to explain wasps to Harper and give Roo a reminder to avoid them! I also hoped that a story about a giant jam sandwich and a cute craft would inspire my son to try something new. Something he has been adamant about not trying, jelly and jam! In the story, 4000 wasps descend upon a town. They are quite a bother but the townspeople roll up their sleeves and get to work making one giant wasp trap jam sandwich! The kids found the book entertaining. Roo was not sold on the idea of jam at all. He said "That's not good. That's sick." He was pretty determined that he wouldn't like jelly, nor jam. Up next we made Jam Sandwiches. My kids go CRAZY for paper food crafts. Like drop everything, We are making a sandwich!? From paper?! Will there be glue sticks involved? Of course, glue sticks were needed. Baby Wipes... You will want these! That was pretty satisfying to the kids. They really like to glue things! They were thrilled to see the finger paint and paint brushes! I told them to paint the jam on their toast. They agreed this was pretty great. Glue and paint after a story? It couldn't get much better! 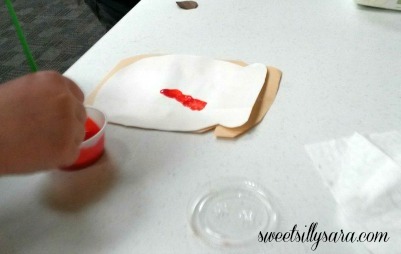 This was a great activity for the kids. They always want to help me cook, so to create their own food craft was a hit. After the story and the craft, I made a peanut butter and jelly for Harper, Roo came in and watched me spreading the glob of jelly around. With a very serious face he told me "That is sick. Bleck. No jelly for me please. I will have honey." I love that kid. He is definitely a guy who knows what he wants. 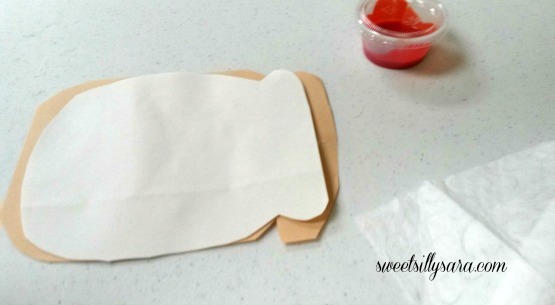 You also might enjoy this Paper Cookie Craft idea for preschoolers.